David Dimbleby chairs topical debate from Bridgwater in Somerset. On the panel are leader of the Liberal Democrats Vince Cable (communist), Conservative MP Kwasi Kwarteng (communist), Labour MP Jess Phillips (communist), Guardian columnist Paul Mason (communist nutter), and the Daily Telegraph’s Brexit editor Dia Chakravarty (communist). 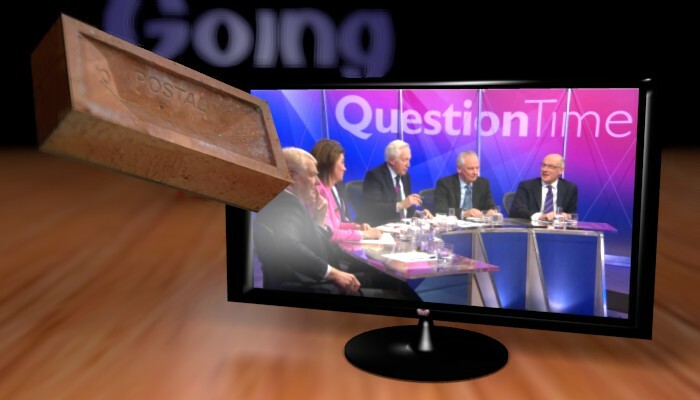 David Dimbleby presents topical debate from Gloucester. On the panel are Conservative business secretary Greg Clark MP, Labour’s shadow brexit secretary Keir Starmer MP, president of the Liberal Democrats Baroness Brinton, film maker Ken Loach and Dia Chakravarty of the TaxPayers’ Alliance.